The Bulgarian Air Force's two tactical fighter regiment changed significantly in the first half of the seventies. 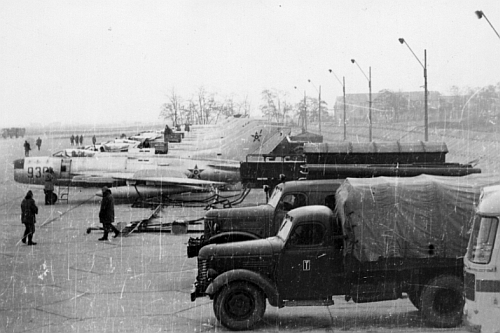 The 19th Fighter Air Regiment at Graf Ignatievo received twelve MiG-21M Fishbed-J type 96 aircraft (from batch 6 and 7) in August 1969. 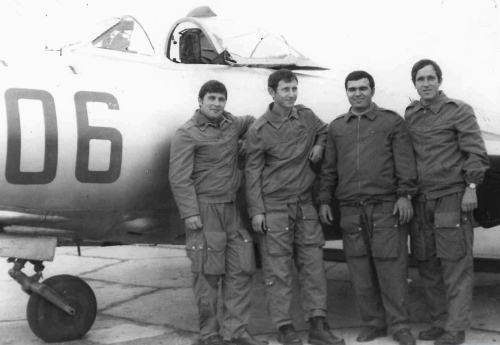 The Bulgarian Air Force’s first nuclear-capable aircraft were a dozen MiG-21M Fishbed-Js. These were followed by three (batch 23) aircraft in early 1970 (built in 1969). All aircraft received a three-digit bort number. 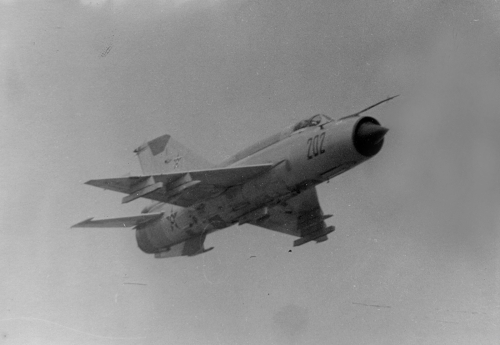 The MiG-21M Fishbed-J was fitted with a built-in GSh-23L Cannon. 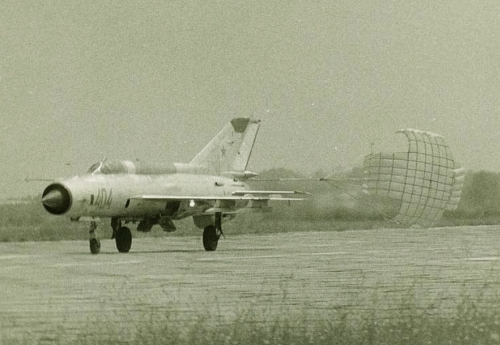 The remaining MiG-21F-13 Fishbed-C were later converted to MiG-21F-13R reconnaissance variant and transferred to the 26th Reconnaissance Air Regiment at Dobrich. Eleven jets of old MiG-19PM Farmer-E interceptor equipped with radar formed the backbone of the regiment's first squadron. Beside them served a few MiG-19S Farmer-C type too. 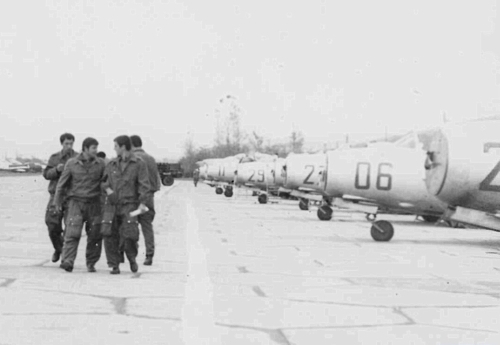 The following pictures are showing the 19th Fighter Air Regiment’s first squadron's MiG-19PM Farmer-E interceptors. At the beginning of the line a few of the second squadron's MiG-21M Fishbed-J combat fighter can be seen. 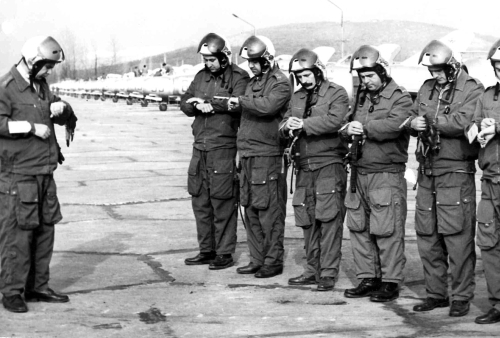 In 1972 a very strange type change took place at Uzundzhovo airport. The 21st Fighter Air Regiment replaced the twin-engine MiG-19S Farmer-C model to the older MiG-17F Fresco-C and MiG-17PF Fresco-D type. In the sixties the Soviet Union delivered more than a hundred used MiG-17 Fresco to Bulgaria, which replaced the complicated MiG-19S Farmer-C. 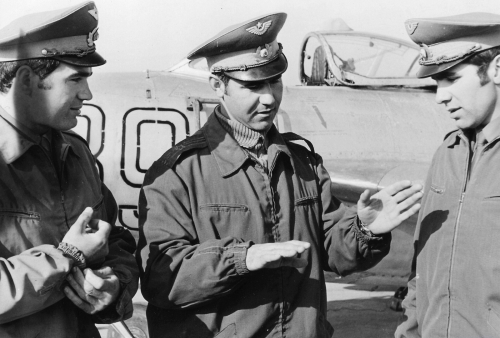 The supersonic MiG-19S Farmer-C was slowly withdrawn, the regiment regressed. Its unreliable RD-9B turbojets mean that the attrition rate in the BVVS hands was extremely high. 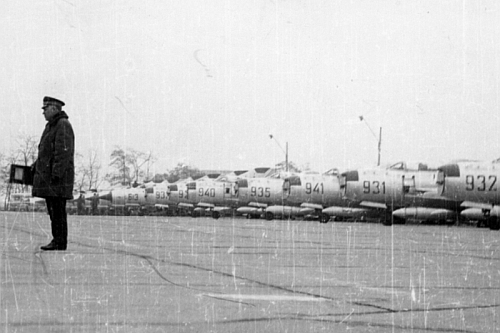 Of the 58 MiG-19S Farmer-C eventually delivered, many were lost in various accidents. This equals an overall loss rate for the Bulgarian “Farmer” fleet of 48.2 percent, near that of the F-104 in European service. The actual accident rate was one loss per 1,000 flying hours. The low service reliability and their high attrition rate of the S variant forced the BVVS to replace the ‘Farmers’ of the 21st Fighter Air Regiment in 1972 with well-proven MiG-17F Fresco-C and MiG-17PF Fresco-Ds.